Have you ever looked at a mixing board and wondered where on earth to start? It can strike fear into many new producers because of the amount of sliders, knobs, and buttons staring back at you. It certainly did with me the first time I saw one. But when you look at them in detail, the consoles are actually very easy to follow. Learning about the layout and functions of a hardware mixer can also prepare you for using a software-based mixer, as they use the same principles of signal flow and design which helps to keep things consistent across both domains. So even if you choose not to have a hardware console in your studio, the knowledge of how one works will still be vital when it comes to using a mixer inside your DAW. I first learned how to use a console on an old Soundcraft desk many years ago, and those lessons made it easy to start using a mixer in my production software. 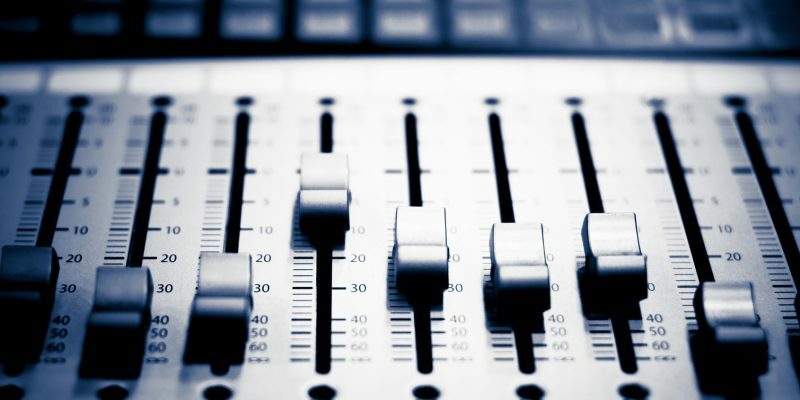 Mixing board, mixing desk, mixing console, sound board, audio mixer – all these names refer to the same thing. I’m sure you’ll see other names used as well. 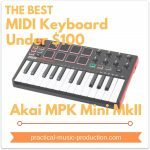 Using the mixing desk you can combine all of the separate pieces of your production into one whole, and then record that as a stereo file ready to put onto a CD, or to upload somewhere as an MP3. the input section is where you send the signal that’s going to be recorded into the mixer. 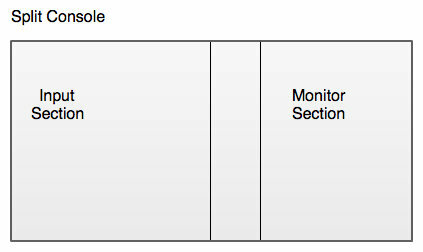 the monitoring section is where you listen back to what you’ve already recorded – the outputs. 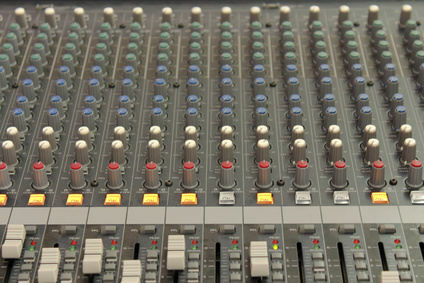 Split mixing consoles have both of these sections situated in different halves of the desk. 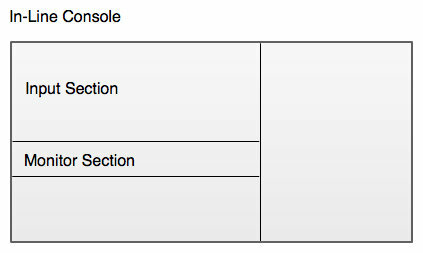 In-line consoles contain both the input section and the monitoring section inside the same channel strip. Let’s look at the typical features of an input strip to see what all the controls are. Once you know these you probably know around 80% of the desk’s controls, as these channel strips are just repeated across the rest of the board. This is where you optimize the signal gain levels at the input stage before it travels any further. Gain level – sets the level of the signal entering the channel’s inbuilt preamp. Pad – this can reduce the input level by a set amount, usually -20 dB, to help prevent distortion of the input signal. Phase Reversal – changes the phase of the input signal by 180 degrees (flips it upside down). Phantom Power – supplies +48 V of power to condenser microphones and DI boxes. 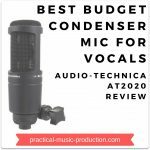 Mic/Line – selects the type of input: mic-level XLR connection, or line-level quarter-inch jack connection. Flip – found on in-line mixers. Changes the channel from input function to monitoring function. You’ll use this section a lot. It’s where a copy of the inputted signal can be sent to various effect units outside the mixing board. 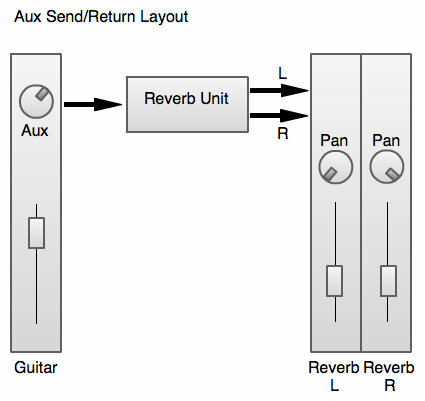 For example, a guitar input might be sent through an aux send to a reverb unit, and the stereo output of the reverb unit returned back to the mixing desk into two other input channels, so you can combine the two signals together (known as the dry/wet mix). 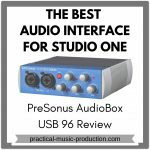 The aux sends can also create a submix of the console’s inputs, which is then usually sent to a monitor or a headphone mix inside the studio. You usually find four to eight aux sends on a desk’s input channel – it depends on the size of the desk, of course. 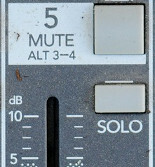 Pre-fader: when selected, the channel output fader (the slider at the bottom of the channel strip) doesn’t affect the amount of signal that is sent through the aux send. This is normally selected for monitor mixes, where a mix of the already recorded tracks are sent to a musician through a pair of headphones as they record a new part. Post-fader: when selected, the channel output fader DOES affect the signal level going through the aux send. This is normally selected when sending the signal to an effects unit, as it’s then easy to control the amount of signal sent to the unit with the channel fader. This places the sound in the stereo field, from left to right. The knob is called the pan pot, short for panoramic potentiometer. This is where you can alter the frequency content of your recording. I’ve written more about this important feature over on the equalizer page. Mute – the channel can’t be heard. Solo – only this channel can be heard, all others are muted. You can solo multiple tracks together. The channel assignment section is mainly used if you are recording to an external source, such as a tape machine or a multitrack recorder. You can select where you want to send your input signal. For example, you may have connected your guitar to input channel 2 on the mixing desk but you want to record it onto tape channel 7. You would send the inputted signal (on channel 2) to output 7 to make sure it was recorded onto the correct track, and to avoid recording over a track you’ve already committed to tape. This is a connection usually found on the back of a channel strip. It allows an external device to be inserted into the signal path of an input channel. These are usually used for a signal processing device such as a compressor, gate, limiter, or an external EQ unit. 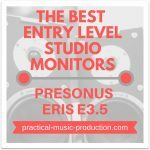 I’ve shown you the basic principles behind the mixing desk and how they’re more or less the same when it comes to comparing physical desks with DAW software mixers. Features such as controlling an input ready for recording, to sending a signal to an effects unit or a software effects plug-in, to applying some EQ to the sound – there are lots of things you’ll be controlling from the mixing board as you create and produce your own tracks. It’s definitely an important part of the studio to learn well.